"By charting the ways in which a small selection of poets, from Yeats to francine j. harris, develop their writing personas and lives, Teicher charts the evolution of Poetry Itself." Section All Staff Suggestions / Non-Fiction Suggestions / Nathalie B. One of our most perceptive critics on the ways that poets develop poems, a career, and a life Though it seems, at first, like an art of speaking, poetry is an art of listening. The poet trains to hear clearly and, as much as possible, without interruption, the voice of his or her mind, the voice that gathers, packs with meaning, and unpacks the language he or she knows. It can take a long time to learn to let this voice speak without getting in its way. This slow learning, the growth of this habit of inner attentiveness, is poetic development, and it is the substance of the poet’s art. Of course, this growth is rarely steady, never linear, and is sometimes not actually growth but diminishment?that’s all part of the compelling story of a poet’s way forward. ?from the Introduction “The staggering thing about a life’s work is it takes a lifetime to complete,” Craig Morgan Teicher writes in these luminous essays. 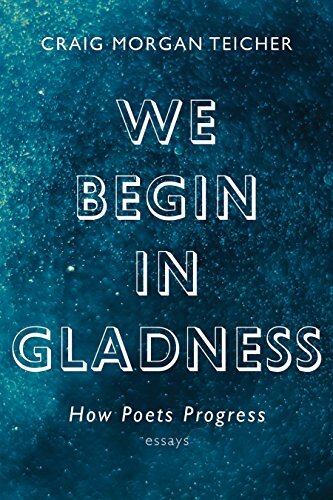 We Begin in Gladness considers how poets start out, how they learn to hear themselves, and how some offer us that rare, glittering thing: lasting work. Teicher traces the poetic development of the works of Sylvia Plath, John Ashbery, Louise Glück, and Francine J. Harris, among others, to illuminate the paths they forged?by dramatic breakthroughs or by slow increments, and always by perseverance. We Begin in Gladness is indispensable for readers curious about the artistic life and for writers wondering how they might light out?or even scale the peak of the mountain.